and a chair or two. 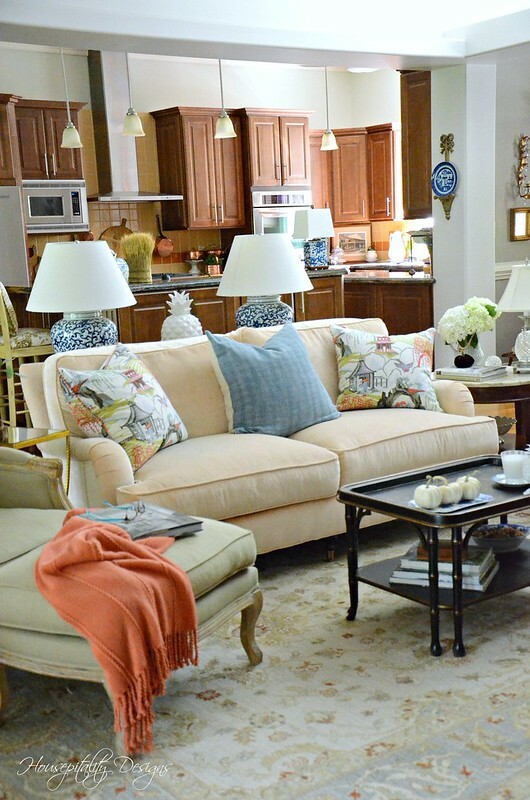 Do you recognize the sofa? . . . It was previously in the Master Bedroom. Now it is our main sofa. Now how about the coffee table? Recognize it? It was previously in the sunroom. Both chairs that are in the Great Room now were in our Great Room previously. They seem to fit well with the sofa. house some pretties and our T.V. Not ideal but it works for us now. 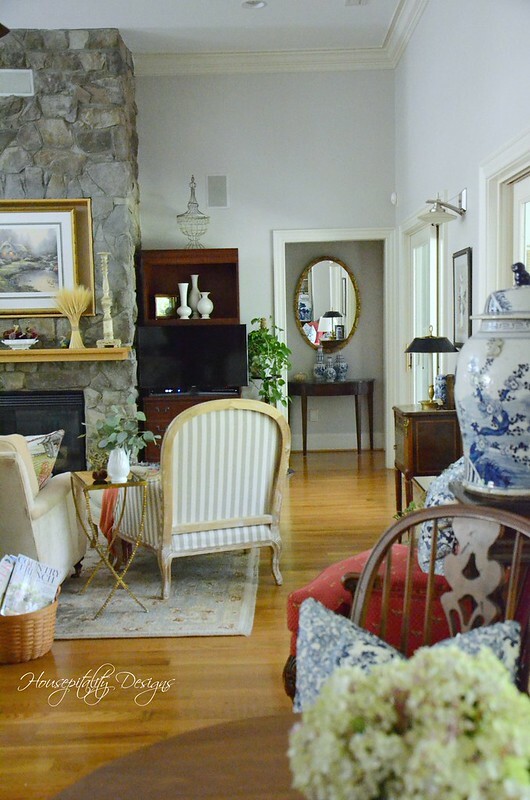 You can see a portion of the foyer in this image below. and a bathroom for the bedroom/study. was previously in our Master Bathroom. As you can see there has been some major furniture shuffling here! at my fav consignment store, Always Home in Durham, NC. I bought it before it hit the floor as it was on the counter waiting to be priced! 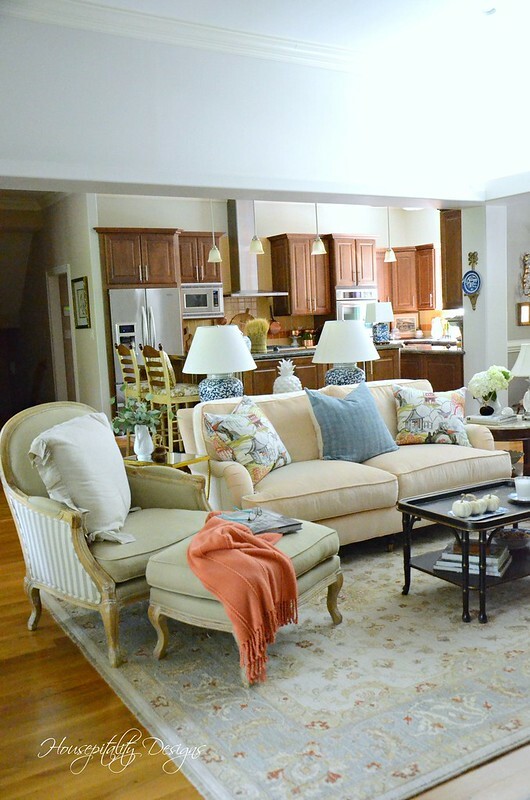 As you can see the Great Room and Kitchen are all one large room. That’s to include the Dining Room and breakfast room too. This taken from the kitchen/breakfast area looking into the Great Room. There are two bar/islands in the kitchen which I will reveal later. is a little nook area that leads to the Master Bedroom. 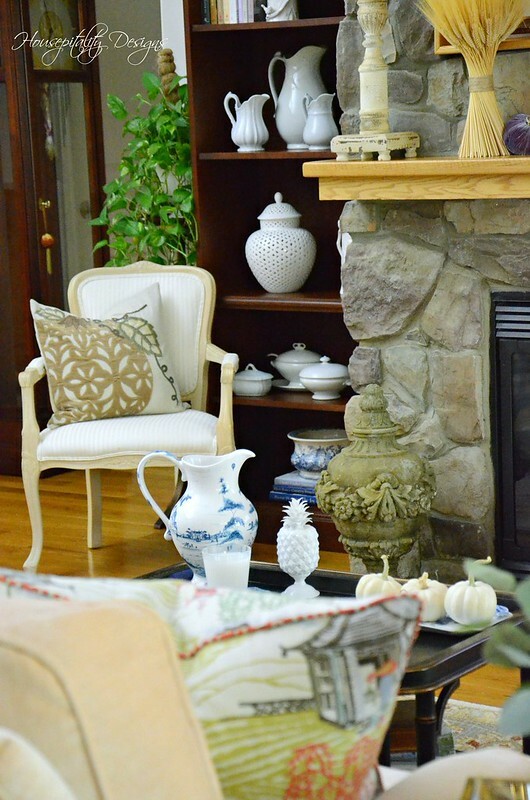 in the Great Room…..a feature that I am truly not fond of. A view from the sofa table. I use this chair to sit and read and watch TV when I have the time. as I must say, the chair sits too deep for me and my feet do not hit the floor! no….. it’s real life and I need that sham! This happens with a lot of chairs for me! 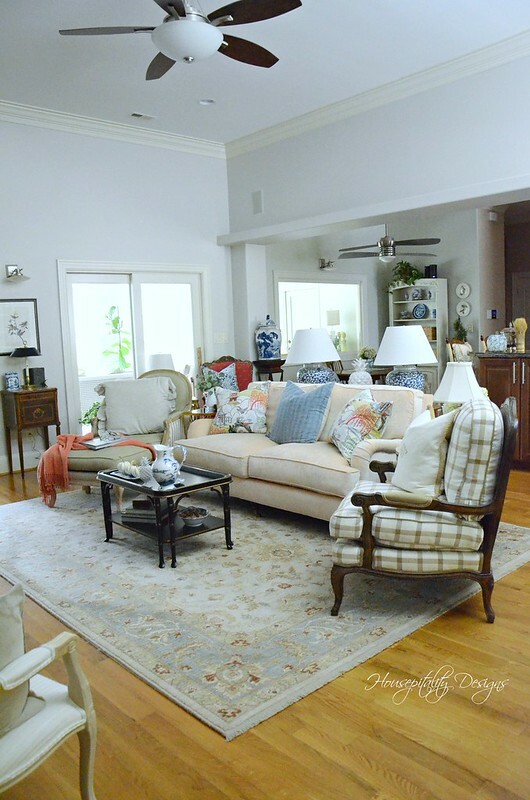 I have placed more seating by one set of the glass doors that lead to the sunroom. There is another set of sliding doors that we use to enter the sunroom. Speaking of sunroom, it is not quite finished and will reveal soon. And here is the view of the room as you enter from the foyer. So there you have it . 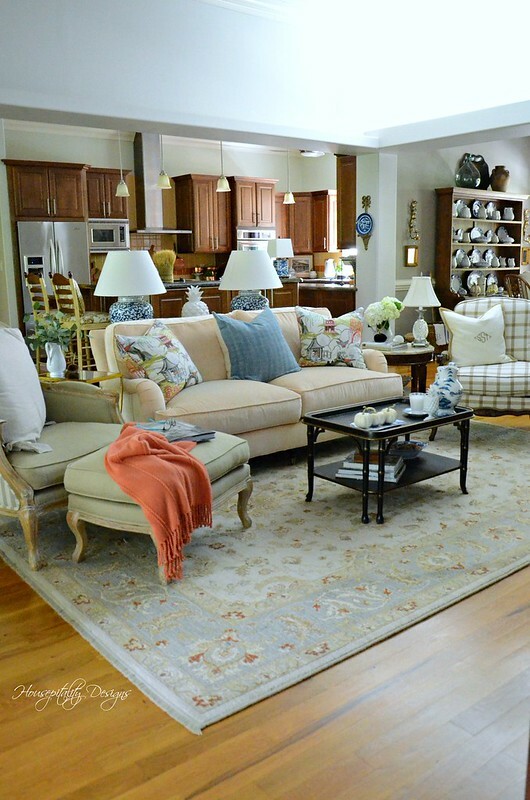 . . the Great Room at the Berry Patch House. Now my dilemma is to figure out where am I going to place the Christmas trees?!!! I will have to do some creative shuffling! 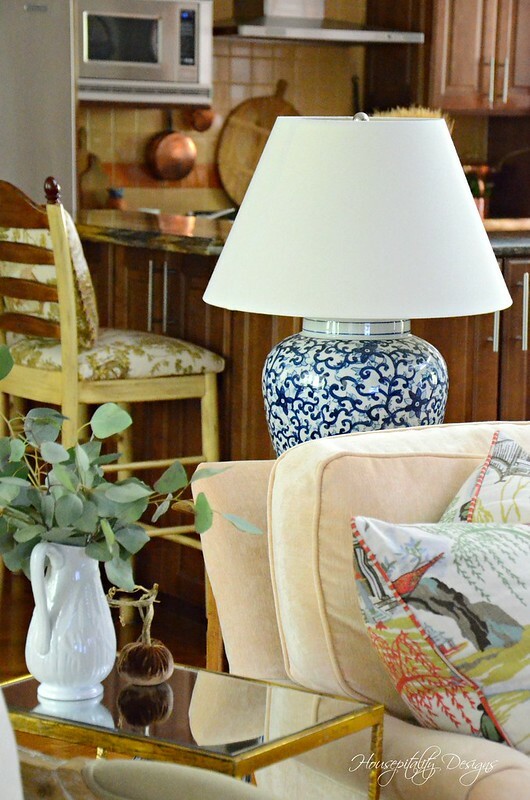 the Nora Murphy Country House Style Book giveaway! You can click on the highlighted text above to enter. The giveaway ends at Midnight, October 11th, 2018. Good luck and again, have a most beautiful day. I will be thinking of those in the path of Hurricane Michael….be safe! You are making your temporay abode nice and comfy and I’m glad you can live comfortably until your forever home is finished. Looks great, Shirley! 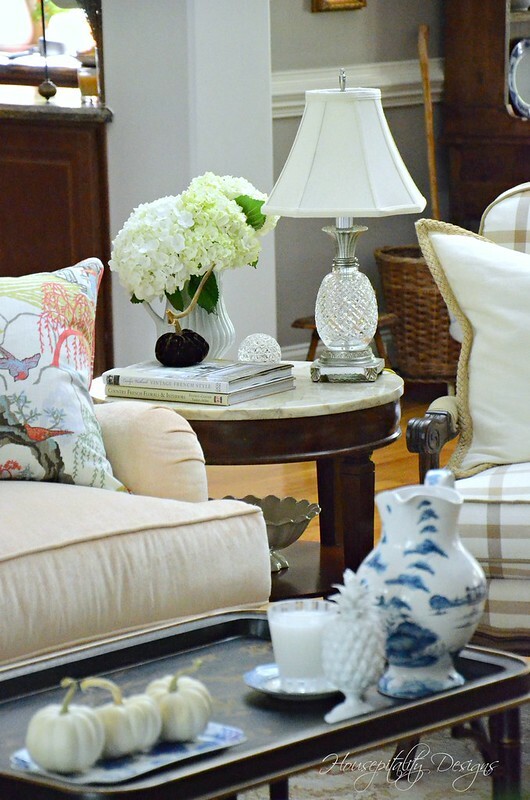 Love the blue and white pieces. 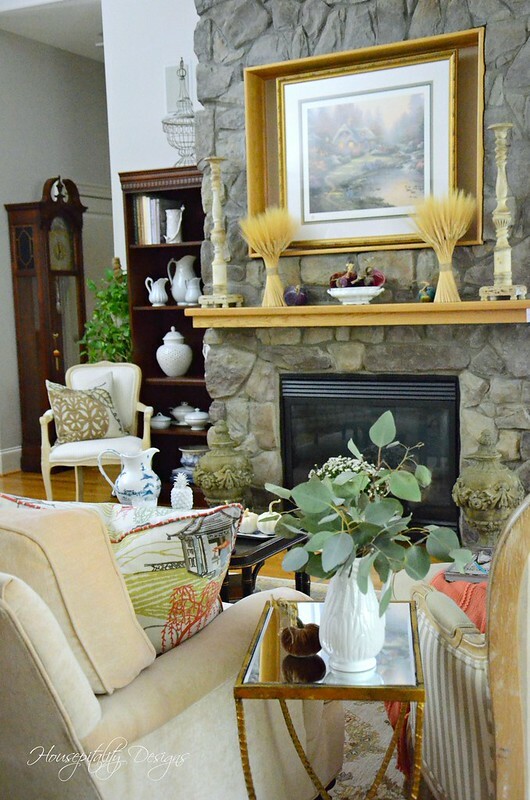 You’ve managed to mix your furnishings together beautifully. 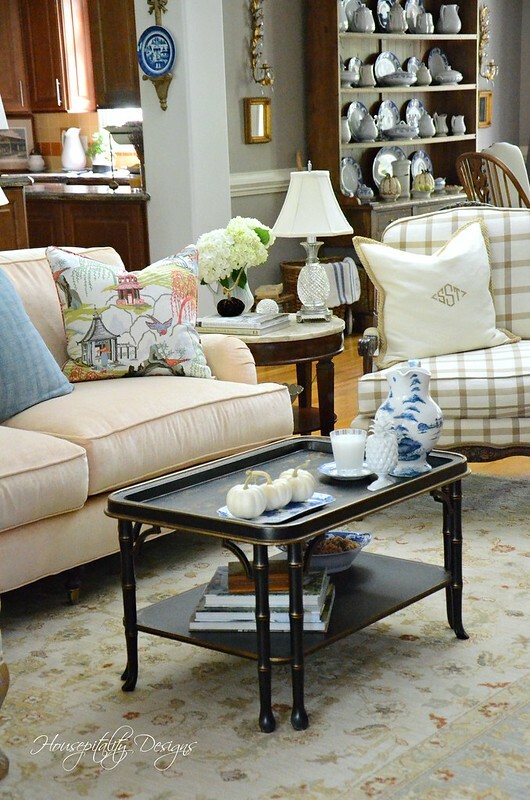 The sofa from the master bedroom looks perfect and I adore the black tray coffee table. The new blue/white tray looks perfect there! You truly live in the nicest rental home I’ve ever seen! Wonderful job of repurposing pieces from previous rooms Shirley. Have a beautiful day also! What a beautiful new place! 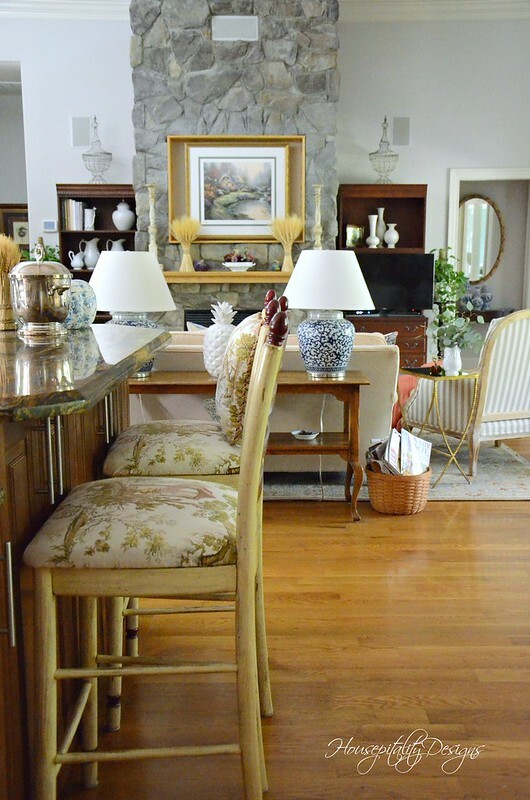 I love how you brought in furniture from other areas in your old home. It must be so much fun playing around with the new space. I just bought Nora Murphy’s book and it is already one of my favorite decorating books! Enjoy the rest of your week! I love the way you are making this temporary house your home, while you build your dream home. 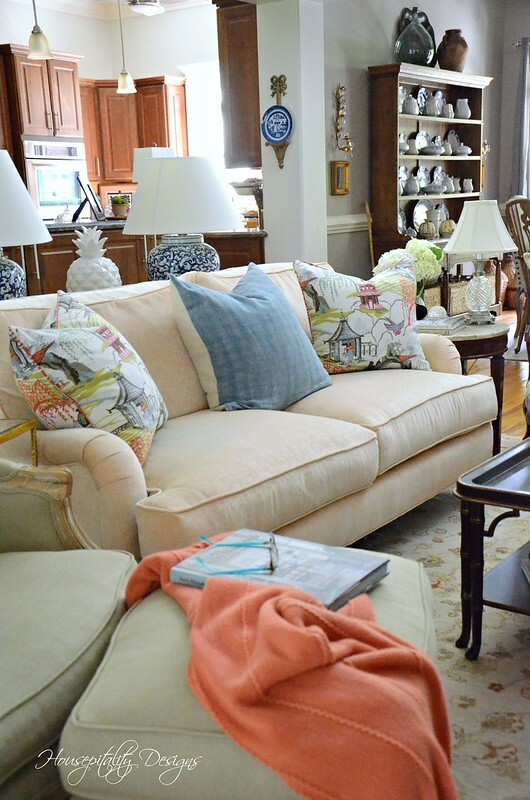 Where is your sofa from? I need that exact digs. typo – sorry – I need the exact sofa! You have done a wonderful job making a temporary house so inviting and livable so quickly!! EEager to see the rest of the house! You have done an amazing job with the Berry Patch house. It is stunning and gorgeous! I love all of your arrangements, and everything fits just so beautifully. Love your new setup Shirley. Where did you get the end pillows on your couch? Loved visiting the At Home consignment shop while there ladtvweek. Pucked up a coupke of goodies. Shirley, you amaze me! 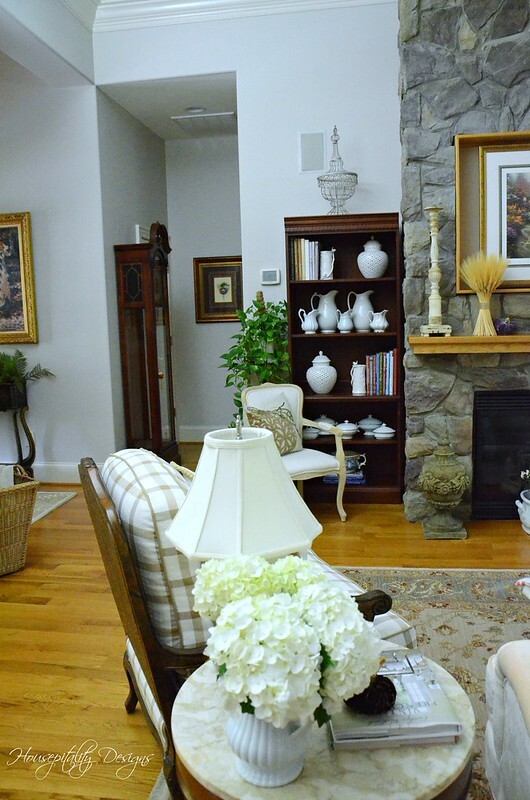 What a beautiful space that you have created in your temporary home! Everything looks beautiful! 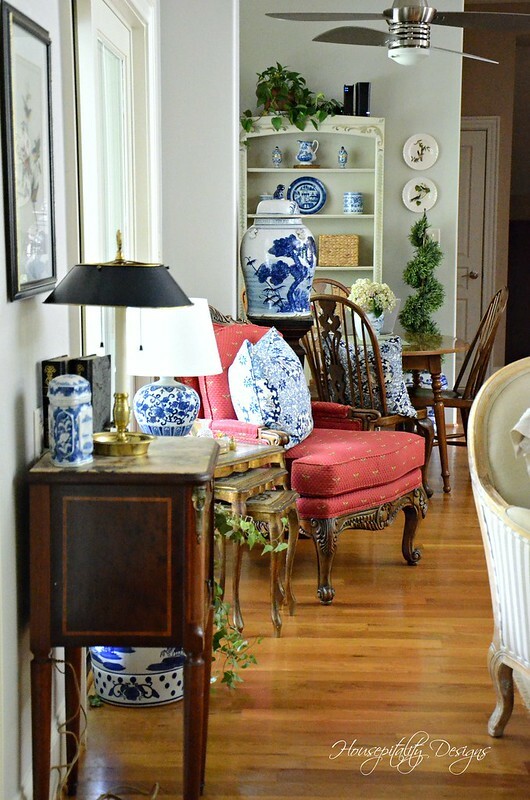 I love the chinoiserie pillows, and I have similar ones in my living room. The blue and white pieces you’ve added look so pretty. Happy Fall, sweet friend!!! Shirley you’ve made a comfortable nest and it is lovely. I still miss your last house. I loved everything about it and I hope the new owners are loving it also. Have a wonderful day! You have the rental house looking permanent! You are a great decorator! 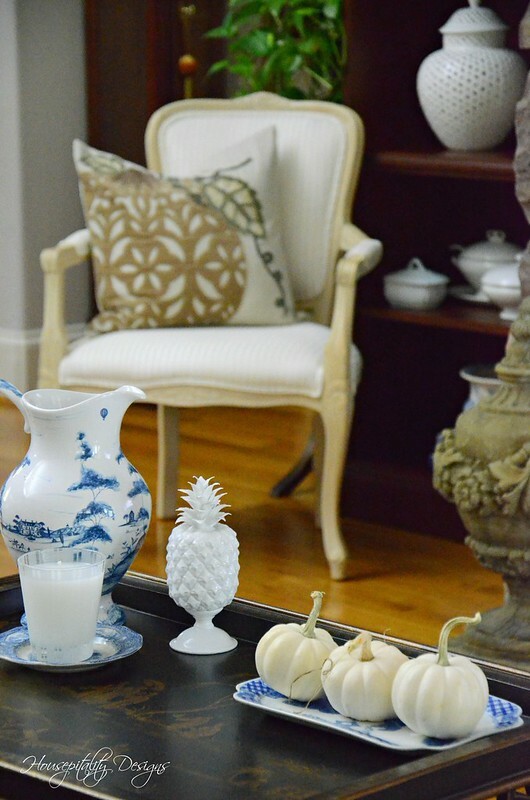 I’m going out now and pack up my Fall decor for the second time. Predicting 40mph wind in the Wilson NC area. Pray everyone stays safe in the path of Hurricane Michael. It’s a beautiful house that you have turned into a beautiful HOME. Shirley, you’ve done a great job of re-using what you can in your temporary space, and giving it style too. I love your new tray with the ghost pumpkins on it. I completely understand the seating dilemma. For me it’s not so much not being to reach the floor, but needing more back support, so I use pillows like that in most every chair I sit in (and another on my lap for having a comfortable reading position). As for the view you don’t like into the MBR – at least you’re having the ability to know exactly what you DON’T want in your new, forever home design! Have a great rest of the week, and prayers Michael doesn’t destroy and devastate. Wow! Wow, wow, wow! I just love your style! How long do you expect to be here until your new home is ready? Everything is looking great. You are making this a wonderful temporary home. Sucjh a comfortable room! I feel we were very lucky to escape this hurricane. It hit about 2 hours away and we do not have any damage! Maybe I will be lucky enough to win the book! Shirley, you are amazing! The room is beautiful and has no appearance of a temporary home. You have a sense of style that is remarkable. I love how you have shuffled everything perfectly! Stay safe! You have made The Berry Patch house so beautiful! What a great job you did knowing what to store and what to use while you build your dream home! I hope Michael does not cause you any trouble. Pray for those affected in Florida as this was such a bad storm. 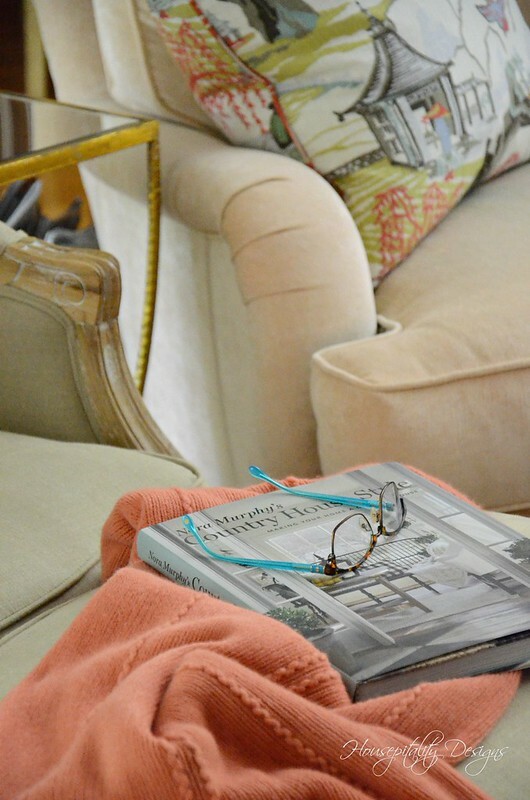 I found your blog through Savvy Southern Style, and I must say, I’m hooked! I quickly added you to my favorites list after looking at your beautiful home. 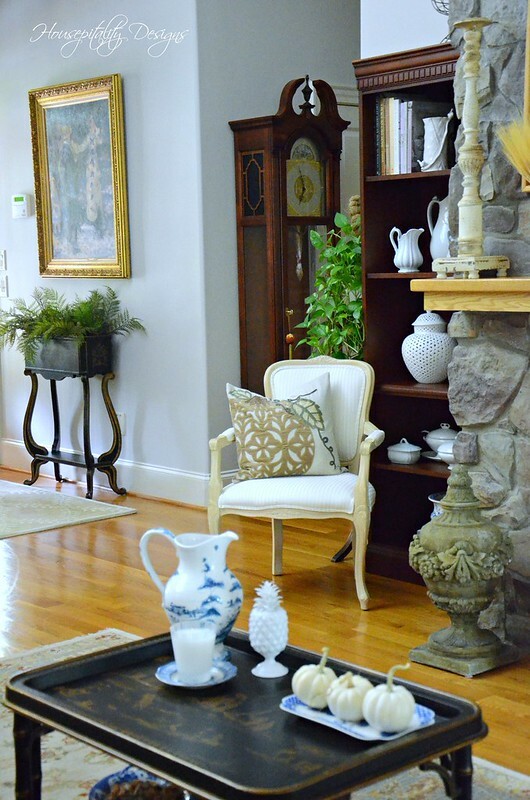 Your style is beautiful, and just what I’m trying to achieve while slowly (and sometimes painfully) converting my home from Modern Country style to a more traditional style with a French Country twist. 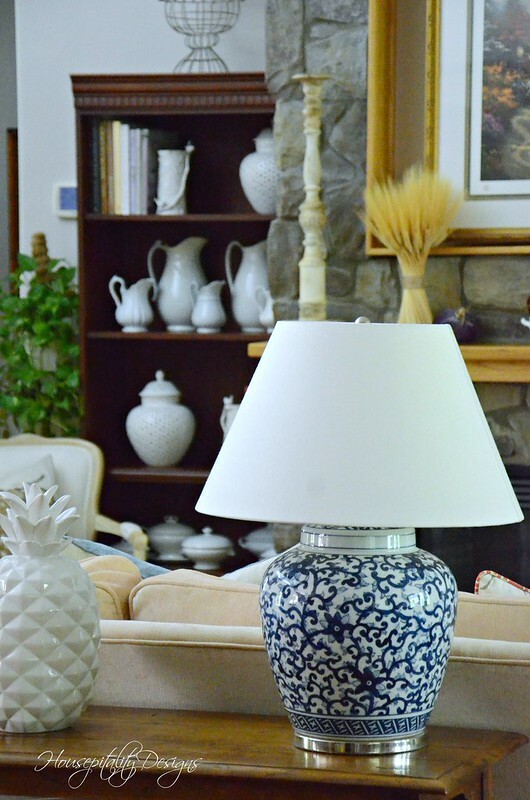 I look forward to going back and reading more of your posts and seeing more of your decorating! It’s great how moving furniture to other locations make it seem like a new piece. You’ve made the Berry Patch house into a home. Lovely. I must say your ‘temporary’ (rental) home is unlike any rental home I’ve ever lived in. ~smiles~ Just beautiful – plus it helps you realize all the decorating things you can mark off your list for your new home. Anticipating that day we get to see the new place. 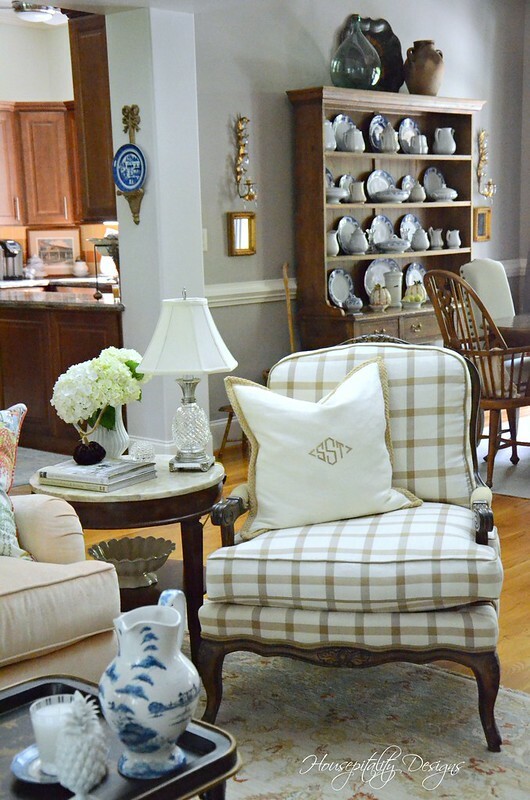 Wow Shirley…this is so elegant and yet cozy at the same time!! I’ve never seen anyone create such a beautiful look in a temporary home and can’t wait to see the new build! Hope you didn’t have much impact from the hurricane. I’m with you on having to succumb to real life in some decorating. Like you, I have short little legs that don’t allow my feet to reach the floor when seated in many chairs. A sham is a practical way to cover a pillow poufy enough to suit your “real life” needs. Because of my silly spine AND a dog that sheds 24/7/365, I had to let practicality win out nearly every time when choosing new furniture! As with all you do, you’ve married comfort and style here! Enjoy!!! Your rental looks like home Shirley! What an easy transition y’all were able to make. Genie says, your home is beautiful, I love all the blue white china!! This is an amazing rental. It’s got wonderful light and plenty of space. I’m looking forward to seeing the kitchen.